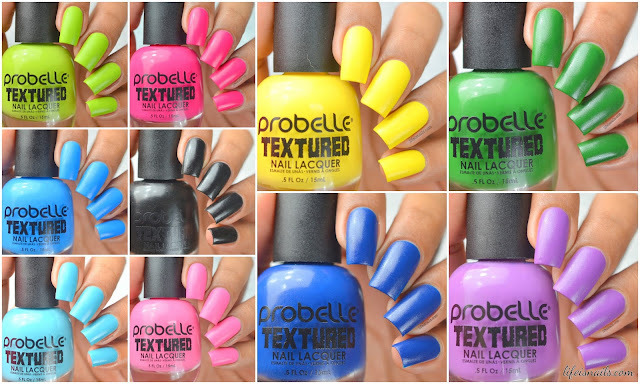 They recently released their new line of polishes called as the textured polishes. The collection consists of 10 bright and basic colors with textured effect finishing which is pretty nice as the textured effect gives your nails a very different look. FORMULA AND APPLICATION: I was very skeptic before I got the polishes in my hands that they might not be able to reach the high expectations I have with So called Textured p[olishes, but when I swatched the very first color which was the light pink one, I realised I was so wrong and these polishes really amazed me with their outstanding formula and slightly textured effect(which I haven't seen before). The application was pretty smooth as well. The textured effect started appearing within 5 minutes but you have to give 15 minutes for the entire polish to dry since you can't apply top coat or it will not be able to show the textured finish. SWATCH INFO: All the colors are swatched with 2 coats of polish and no top coat . They are pictured in indoor diffused lighting to get the real color. Light Pink Textured Polish - It's a light pink colored textured polish. Hot Pink Textured Polish - It's a hot pink colored textured polish. Light Green Textured Polish - It's a light neon green colored textured polish. Yellow Textured Polish - It's a basic yellow colored textured polish. Turquoise Textured Polish - It's a turquoise blue colored textured polish. Purple Textured Polish - It's a basic light purple colored textured polish. Light Blue Textured Polish - It's a sky blue colored textured polish. Dark Green Textured Polish - It's a medium-dark green colored textured polish. Dark Blue Textured Polish - It's a medium-dark blue colored textured polish. Black Textured Polish - It's a basic jet black colored textured polish. You can get these beautiful polishes here at ProBelle Beuty online store.